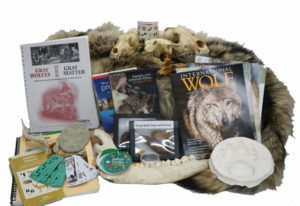 The Wolf Discovery Kit is filled with a variety of artifacts, books, videos and activities providing resources for students to conduct inquiry-based learning. 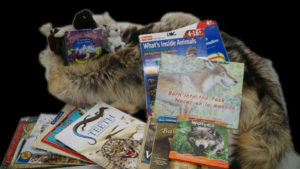 Whether teaching about predator-prey relationships, using science notebooks, researching and writing reports, measuring and weighing, or comparing fact versus fiction in literature this kit is for you. Students will gain an interdisciplinary picture of the complex issues surrounding wolf survival and will be able to make informed decisions about the wolf’s role in an ecosystem. The many books and videos spark investigative learning and challenge students of all levels to analyze complex information. Real artifacts, including a wolf pelt, radio collar, deer antler, and wolf and prey skulls add a tactile component giving students hands-on opportunities to examine and compare specimens. With a Standard Kit you can add a Supplemental Kit to meet the needs of your group for no additional fee (There will be an increase in shipping costs.). Supplemental kits for kindergarten through third grade or fourth grade and up include additional resources at appropriate reading levels. To find out how to prepare for the kit before it arrives and how to continue learning afterwards please check out the Wolf Discovery Kit Teacher Page. Updated Kits for 2019 are lighter in efforts to reduce shipping costs. The Wolf Discovery Kit costs $75 for a two-week period. This price includes shipping to your school or business. You are responsible for paying the return shipping expenses, which will vary depending on your location. 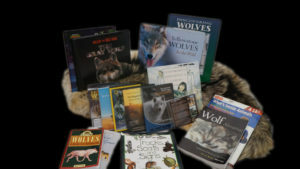 Payment by check or credit card is required for all Wolf Discovery Kits prior to shipment. Please allow 10-14 days to process your payment. Reserving your kit well ahead of time will help assure that your preferred dates will be available. To avoid additional charges when renting a Wolf Discovery Kit, please check its contents upon arrival and notify us immediately of any damages that may have occurred during shipping. Our agreement is to return all items in the same condition as received. You will be billed for any lost or damaged items up to the replacement kit value of $1,500.